Doctors are busy. Years of intense education followed by more years of specialty training in rigorous programs that require at least 80 hours of hands on-work per week coupled with preparation for notoriously challenging exams that take months to study for leaves physicians with little time to manage finances. And the truth is that few doctors are in it for the money, making money know-how relatively low on the list of most physicians’ priorities. But understanding money is an important part of life, whether is it appealing to you personally or not. As with most important things in life, managing money requires building some foundational knowledge. There are 7 important facts that all doctors must accept about money management. Money management includes investing, saving, tax planning, preparing for big purchases and making decisions about what kind of medical practice you want to work in and for how long. Doctors need to make time to either personally manage finances or to hire a financial advisor to help with the process. Overall, learning about money management isn't profoundly difficult, but it isn't extremely easy either. For physicians, the concepts are certainly understandable. It just takes some time to learn the basics by reading, going to seminars (and not getting sucked into whatever they are selling) and watching up-to-date and informative programs or tutorials. Investing is a necessity for keeping up with inflation. Whether doctors' salaries grow with inflation, stagnate or decline in comparison to inflation, inflation is a reality. The savings that you put aside for retirement comes from money that you earn between 5 to 50 years prior to retirement. This means that, when you take inflation into account, that savings is probably not going to be enough to sustain you for years of comfortable living unless you invest it. 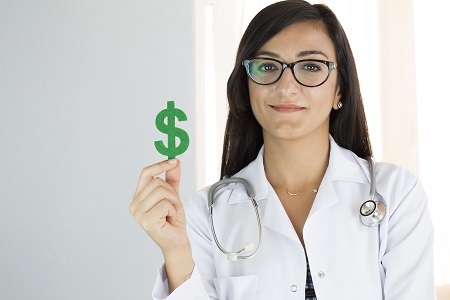 Even if you are delighted with your current income as a physician, time will move forward and the dollar you earn today will be able to buy somewhat less when you retire than what it can buy now.